The allure of the archive as a concept, space, form, and metaphor has proven irresistible for continentally inflected media and cultural studies over the last two decades. The “archive fever” diagnosed by Derrida in 1995 has only become more acute as the ever-accelerating digitization of culture, memory, and history has fundamentally reconfigured archives, both real and imaginary. 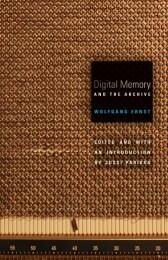 Digital Memory and the Archive intervenes in this ‘archival’ moment by offering the first major collection of essays in English by one of the central figures in contemporary ‘German’ media theory and a thinker for whom archive has been an animating concern, Wolfgang Ernst. The book offers a much anticipated entry point into Ernst’s influential work, which has hitherto been largely absent from contemporary debates in North American media and communication studies around new materialism and the nonhuman turn. Ernst’s provocative propositions about doing media theory, writing media history, and the state of media studies as a discipline make the book of interest to readers not just in those fields, but also in communication and information studies, computer science, history, and the (digital) humanities more broadly. Digital Memory and the Archive is edited and introduced by Jussi Parikka, who in recent years—along with Geoffrey Winthrop-Young, John Durham Peters and others—has been doing a great service to English readers in relaying texts and thinkers from the German tradition of media analysis. Parikka’s introduction offers a series of biographical notes about Ernst that provide useful context both for the essays that follow, and the latter’s intellectual formation more generally. It productively situates Ernst’s break with conventional History and Classics, as well as his relation to what Winthrop-Young (2011) calls the “[Friedrich] Kittler effect,” while also offering some suggestive planes on which Ernst might be connected to recent developments in North American media studies. Parikka organizes a number of diverse essays around three conceptual hubs: “The Media-Archaeological Method,” “Temporality and the Multimedial Archive,” and “Microtemporal Media.” These help to map not only the trajectory of Ernst’s thought (helping contextualize, for instance, his continuing move toward computation and mathematics), but also to streamline his most influential contributions to media analysis. The latter are primarily centred on methodology, “time-criticality,” and the development of non-narrative modes of doing media history and theory. This review will touch briefly on each of these interrelated planes as I sketch out in a very preliminary way Ernst’s unique approach. Ernst has pursued a dynamic and at times controversial intellectual project that has taken shape in recent years under the rubric of “media archaeology.” Though trained in History and Classics, Ernst turned toward media after he became convinced that the existing theoretical and methodological frameworks of these disciplines (and the traditional humanities generally) were not capable of offering a comprehensive picture of historical change and dynamism. To address such limitations, Ernst has been heavily influenced by media philosopher Friedrich Kittler in developing a radically materialist approach to studying history, memory, and culture through a series of books, a prolific lecture circuit, and initiatives such as the Berlin Media Archaeological Fundus (a laboratory at Humboldt University devoted to the study and operationalization of “dead” media). Digital Memory and the Archive collects essays from the last ten years of this project, and positions the brand of media archaeology it contains as a “transatlantic bridge” between certain developments in continental and German media analysis, and those in North America such as software and platform studies (see Manovich 2001; Chun 2011) or media forensics (see Kirschenbaum 2008). even before a historian or a media archaeologist steps in to tell stories about history, past media cultures, and lost ideas, there is a prior level on which the past has been recorded. The documents of the past are such concrete instances of pasts present but even more so of the way in which technical media records time and acts as a time machine between current times and the past (9). Connections between Ernst and other thinkers in the German media studies milieu are obvious—beyond Kittler, there are clear resonances with Cornelia Vismann, Sybille Kråmer, Bernhard Siegert and others—but the essays of Digital Memory and the Archive notably foreground just how formative an influence American historian Hayden White has been on Ernst. The integration of White into contemporary debates is noteworthy given that he is not a figure that has had much currency in media studies traditionally, and also because it offers an opportunity to reclaim White’s work from its unfair relegation to the scrapheap of extreme 1970s and 80s postmodern relativism. Ernst picks up the thread developed in White’s Metahistory (1973), arguing that the monopoly of narrative that structures the historical imaginary of the 19th century has continued to enjoy preeminence in media and cultural historiography right up to the 21st century, in spite of the epistemological ruptures inaugurated by first technical, and later digital, media. Which is to say, the narrative form—a relic from the epoch of the written word—is the secret that continues to haunt the stories we tell about media history. In order to more properly account for the world after digital computation, Ernst updates and extends White’s analysis beyond the confines of the Gutenberg galaxy. He writes, “I have always felt uneasy with the predominance of narrative as the unimedium of processing our knowledge of the past. It takes a new infrastructure of communicating realities—the impact of digital media itself—to put this critique of historical discourse into media-archaeological terms and practice” (196). The challenge, according to Ernst, is to develop new tools of writing and thinking about the past and memory in terms more accurate to the contemporary epoch’s media-technical conditions of possibility. To develop such an approach Ernst emphasizes the relation between media and time. Specifically, he is interested in the way categories and practices of memory and history emerge as a corollary of the ways that media-technics process and store time. Foregrounding this relation allows him to argue persuasively that the imperative for media studies must be “time-critical” (18-19). This argument updates not only White but also Foucault, following Kittler in pushing Foucauldian discourse analysis beyond its space bias—not just taking “Foucault the last historian or first archaeologist” (Kittler 4-5) out of the library and into the realm of technical media, but also taking the concept of archive much further. Ernst writes, “[i]t is worth remembering that the archive as the condition for our knowledge of history becomes dependent on the media of its transmission…The mechanisms that regulate entry into the discourse of history or exclusion from cultural memory are therefore part of the media archaeological investigation” (42). Foucault grasped this to a certain degree, but Ernst shows that his medial blind spot regarding how the archive is transmitted prevented Foucault’s archaeologies of knowledge from moving beyond the spaces of the written word (whether formal state archives and libraries, the paper surfaces of documents, observation charts and tables, concepts, etc. ), and therefore his analyses cannot offer a comprehensive picture of history, memory, or knowledge outside the world of writing. Ernst argues that when we look beyond alphabetic writing to technical media such as the phonograph and cinematograph we see that “signs of or in time themselves can be registered. Not only do they maintain a symbolical relationship to macro and micro time (such as historiography), but they inscribe and reproduce functions of time themselves” (30). After technical media the mechanisms that transmit, store, and process—that is, mediate—archival information are not reducible to their spatial functions (as with writing and its documentary apparatus) but instead inaugurate whole new regimes of time. They do so precisely because they are themselves entirely new modalities of measuring and recording time. Digitization offers a similar rupture: “[i]t is only with the digital computer that the symbolic regime dialectically returns, this time in a genuinely dynamic mode (which differentiates implementation of software from the traditional Gutenberg galaxy): algorithmic time and operative diagrams” (30). So while technical media inaugurate time-critical media studies by foregrounding the extent to which media record the ‘flow’ of human and machine time, it is not until digital media that we come to see that this flow is comprised of discrete, operative units and processes that escape human perception. Digital times are processual and discrete, rather than static and continuous; they are operational rather than narrative, re-inscribing the symbolic as binary 1s and 0s in place of alphanumeric letters. As a result, the digital archive itself has become an entity always already in flux, continuously in-formation, and its analysis requires new conceptual tools such as Ernst develops. Time-critical analysis extends and complicates many of the inherited conceptual categories of media studies. For instance, Harold Innis’ (2008) formative insights regarding ‘time-biased’ media and the societies they structure are complicated by Ernst’s distinction, absent in the Innisian concept of time, between operative time (such as we find in the algorithms and code of the digital archive) and the static time of the ‘classical’ archives of the written word. The latter primarily transmits via storage, while the former performs all three data operations—processing, storage, transmission—at and in the same time. The distinction Ernst introduces offers a productive vein through which to address a common critique of Innis’ concepts of time- and space-bias (that they are too totalizing) by allowing us to account for many often competing times present in any given media device, network, or environment. “The moment a singer of epics sings into a current recording device, two different regimes clash as human performativity is confronted with technological algorithmical operations” (59). Ernst is particularly insistent that these times be understood according to their own operative dimensions—by going ‘under the hood’ of media—rather than in relation to inherited, abstract notions of human time that often go unquestioned. Media archaeology deals with this crisis in the narrative memory of culture. Digital narrative, on a media-archaeological (not interface) level, is linked to discrete mathematics…A computing culture, from a media-archaeological view, deals not with narrative memory but with calculating memory—counting rather than recounting, the archaeological versus the historical mode (71). Such insights are only available to us, Ernst argues, by opening up the black boxes of media devices so that we might observe and tinker with their hardware. Doing so allows for empirical understanding of the ways in which media objects and systems function. Since “[m]edia theories work only when being tested against hard(ware) evidence” (60), the importance of his Media Archaeological Fundus (mentioned above) to Ernst’s project cannot be overstated, and this methodological commitment to actually doing media archaeology is another aspect that further sets his work apart from much media theory. Since time-critical media studies require a break with narrative historiography, Ernst seeks to mirror form with content by avoiding narrative as a rhetorical strategy throughout the book. The result is an unconventional text that unfolds more via affirmation and aphorism than analytic argumentation—by counting rather than recounting—a style that is at times exhilarating, at others frustrating. The ambition is admirable, but in certain chapters (particularly experimental chapters 9 and 10) the sacrifice of clarity in the name of formal rigour weakens the force with which the argument is delivered. But the point should not be lost that Ernst’s foregrounding of historians’ reliance on the formal structures of narrative to tell their stories offers important insights into the way a narrative unconscious is always already delimiting not only what stories we can tell, but the very fact that we are telling ‘stories’ in the first place. Ernst pushes this point even further than White, elaborating a compelling argument that not only is there a crucial relation between the medial infrastructures that obtain in any given historical moment and its modes of thinking and doing history, but that these infrastructures are at core about time. Some of these discussions do stall at a level of abstraction that contradicts the materialist program with which he is so preoccupied. In particular there is a disappointing lack of specificity with regard to certain concepts integral to his theoretical apparatus. The term “Archive” wanders at times opaquely through the text—a precise definition is never offered, and the term functions in a wide variety of ways (as a collective memory form, data processor, historical subject, storage space, etc.). We can probably forgive him this, given that a major aim of the work is to clear the concept of its cultural studies baggage in order to see what it might do when re-imagined in terms of hardware and operative time. More problematic is the extent to which terms like “format” and “protocol” seem often to be free-floating catchall terms that conflate many important distinctions, operational and otherwise. For instance, Ernst only rarely discusses specific software formats, and even less often gestures toward the fact that these entities do not drop from the sky, but are developed in very specific institutional, political, industrial, socio-economic, cultural, and technical constellations, as for instance Sterne (2012) shows. Ernst’s emphasis on unit operations conflates such layers of analysis under an abstract category of ‘format.’ A discussion of pixel-based imaging in chapter six (130-137), for example, does not take into account that various computing hardware and software operate according to different protocols, resulting in a diverse array of competing imaging formats (JPEG, PDF, TIFF, etc.). While Ernst’s point about the new temporal horizon of digital imaging (always in-formation rather than static) is well taken, the reader is left to ponder questions such as: do all imaging formats operate according to the same time? If not, how are their times different and what implications follow? And if so, does this imply a new temporal ontology of digital computation? Doesn’t the latter contradict remarks elsewhere about competing digital times? Too often with Ernst—to invoke a familiar critique of the German milieu—media apparatuses seem simply to appear. As Parikka notes, they “might be important to give us history (as conditions of knowledge) [but] seem themselves surprisingly without history and outside time” (11). These limitations would be easier to excuse in a work as ambitious as Ernst’s were it not for his repeatedly stated commitment to object-oriented empirical specificity and rigour. Unfortunately, he at times falls victim to what Gitelman describes regarding the tendency in media studies to sacrifice empirical and historical specificity in the name of grand theories of everything (Gitelman 3-5), and her advice about resisting the urge to frame media objects or systems in such general terms—to speak not simply of “the telephone” or “the computer” but specifically about e.g. telephones in the 1890 rural United States, or tablet computers in 2012 (Gitelman 8)—would have been well-heeded here. Much time and energy has been devoted recently toward urging more traditional disciplinary orientations in the humanities to take approaches such as media archaeology more seriously. Indeed, so much energy has been devoted to integrating figures like Ernst into English-speaking debates that the arguments themselves (and their limitations) may have been too quickly glossed over. Now that that battle has been won for attention, thanks in large part to books like Digital Memory and the Archive, it is incumbent upon those that have championed such work to take critical stock of what is on offer, and how it might be problematized, extended, and elaborated. It is in such a spirit that I have offered the above remarks. Chun, Wendy Hui Kyong. Programmed Visions: Software and Memory. Cambridge, MA: MIT Press, 2011. Print. Gitelman, Lisa. Always Already New: Media, History and the Data of Culture. Cambridge, MA: MIT Press, 2006. Print. Innis, Harold A. The Bias of Communication 2nd ed. Ed. Alexander John Watson. Toronto: University of Toronto Press, 2008. Print. Kittler, Friedrich. Gramophone, Film, Typewriter. Trans. Geoffrey Winthrop-Young and Michael Wutz. Stanford, Cal: Stanford University Press. 1999. Print. Winthrop-Young, Geoffrey. Kittler and the Media. Cambridge, UK: Polity Press, 2011. Print. Interestingly, while readers of Innis will recognize his influence throughout this book, the Canadian medium theorist is only mentioned a single time in passing (100). While Ernst is much better at citing his influences than for instance Kittler, his Innisian blind spot is an example of the extent to which media archaeology is at times ignorant of its own archive. Certainly, Canadian readers will view it as yet another unacknowledged debt in contemporary media studies to the foundational work of Innis and the Canadian school of communication. Liam Young is a Lecturer and PhD candidate in Media Studies at The University of Western Ontario, where he writes and teaches on media materialism and communication. His current research, nearing completion, focuses on the list as a cultural technique of documentation and administration. A new project, under development, situates the Canadian School of Communication in relation to contemporary new materialism and the ‘nonhuman turn.’ Recent writings appear or are forthcoming in Theory, Culture, and Society, the Canadian Journal of Communication, and Amodern.